A press-in crust makes this dessert easy even if you've never made a pie. The brandied mascarpone topping gives it a special-occasion touch. Preheat oven to 350° with 1 rack set in the center and a second rack set on the rung closest to the broiler. In a food processor, pulse flour, 3 tbsp. sugar, 1 1/2 tbsp. ginger, and the butter until fine crumbs form. Add egg yolk and whirl until dough comes together. Press over the bottom and 1/2 in. up the sides of a 4- by 14-in. tart pan with a removable rim (or use a 9-in. round tart pan). Combine 6 tbsp. sugar, remaining 1 tbsp. ginger, the cinnamon, 1 1/2 tbsp. lemon juice, and 1 1/2 tbsp. brandy in a bowl. Core persimmons, slice 1/3 in. thick, and stir into brandied sugar. 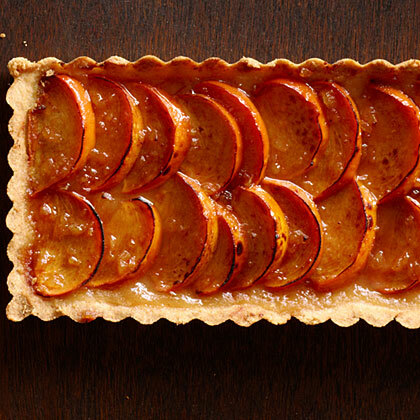 Arrange fruit in 2 overlapping rows in crust (for a round pan, in circles). Spoon sugar mixture from bowl over fruit. Bake tart on center rack until crust is deep golden, 25 to 30 minutes. Cover loosely with foil and bake until persimmons are tender when pierced, 20 to 30 minutes more. Remove tart from oven and preheat broiler. Set tart on a baking sheet. Cover pastry edges with strips of foil. Broil on rack close to heat until edges of fruit brown, 1 to 2 minutes. Let cool at least 30 minutes. Whisk mascarpone and cream with remaining 2 tbsp. sugar, 2 tbsp. brandy, and 2 tsp. lemon juice. Loosen crust from rim with a small knife, then remove rim. (Tip: Set pan on 2 small cans, such as single-serving juice cans, and rim will slide off.) Serve with mascarpone.